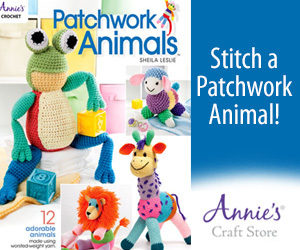 The Jungle Playbook Part Six, a fun ‘quiet’ crochet playbook with a jungle animal theme. Yarn blue – changed yarn after each row. *work 3 DC into next 2 CH; work 1 DC into next 3 CH; work 3DCtog x 2; work 1 DC into next 3 CH. *work 3 DC into next 2 SC; work 1 DC into next 3 SC; work 3DCtog x 2; work 1 DC into next 3 SC. work 1 DC into next ST; work 1 HDC into next ST; work 1 SC into next 3 STS. *CH 3; SL ST into 3rd CH from hook (picot made); work 1 SC into next 2 STS. Repeat from * until end of top. CH 3; SL ST into 3rd CH from hook (picot made) – this is the TAIL! Continue working in the round all along the bottom – SL ST into each ST. When you reach the ‘nose’ – fasten off and weave in all ends. work 1 SC into last 2 STS. SL ST all around piece; SL ST into first SC worked on last row. NOTE: my lion does not have ears – the reason for this is because my daughter wanted something else then crochet for the ears – (I just did not have it in time for the release of this part)! Work [1 SC; 2 DC; 1 SC] into next ST; SL ST into 6 STS; work [1 SC; 2 DC; 1 SC] into next ST; SL ST into the remaining STS all around. For all the remaining rounds work into the BACK-LOOPS only! RND 4: *work 2 SC into next SC; work 1 SC into next 6 SC. Repeat from * all around (48 SC). Option 3: Crochet wavy hair – work back in reverse thru each front loop and crochet 3/4 random STS into loop – for exp: [2 SC; 1DC] or [1 Sc; 1 HDC; 1 DC; 1 SC] or 3 HDC and so on! sew body into position just above the river. STEP THREE: Embroider a nose and a mouth onto the lion’s face. Sew the lion’s face just above the body – see photo. so that the ‘mane’ can fit over it! STEP FOUR: Sew grass onto the page – see photo for positioning. STEP FIVE: Attach/Knot one bead to the end of the decorative rope or ribbon. 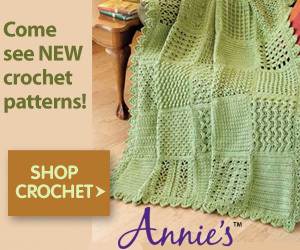 Optional – crochet a a single chain of about 40/50/60 CH. Use your river to measure the length. Then weave it thru your crocodile! See Photo! Then weave thru the right side of the 4th row – working from the inside to the outside. Glue a 12/15 mm googly eyes onto face. NOTE: Leave the left part of the page empty as shown in photo above! CH 12 – SL ST into first CH and form a ring. RND 1: CH 1; work 1 SC into each CH all around; SL ST into first SC worked. RND 4: SC2tog x 4.
work [1 SC; 1 DC; 1 SC] into each loop all around. Embroider a nose and mouth with some black yarn; then sew face onto body – only the ‘face’ part and not the mane! Glue 10 mm googly eyes onto face. Join Me Next Week For Part Seven!